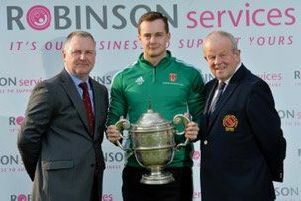 Lisburn’s Ulster Fourball star Chris Davis (19) has won the Fred Daly News of the World Trophy with a nett 69. Despite a seven at the third, he reached the turn in 42. He dropped five strokes in the next three holes but recovered to win by one stroke from Andrew Neill (12). Eight players finished on 71: Colin Hill, David Phelan, Trevor Doak, John Kelso, Andrew Coulter, David Reid, Aaron Marshall and Kyle Patton. Colin was awarded third place on count back. Ryan Symington ended with two threes to win the best gross with a 73. He finished one ahead of Aaron Marshall and two ahead of Chris Moulds and Kyle Patton. 1st Noel Robinson 39pts, 2nd. Richard Shepherd 37pts, 3rd Jim Burns 36 pts.